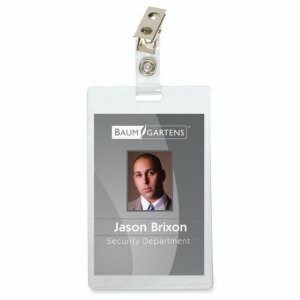 Self-laminating badge holders with strap clip lets you make an instant ID. Sturdy badge holders are self-laminating to protect your badge or business card. Included strap clip allows ID to be attached to pocket or lapel. Great for use on luggage and briefcases. Paper inserts are not included. Each badge holder accommodates up to 3-1/2" x 2-1/4" badges (sold separately).